Warhammer 40,000 – The Escalation Campaign is over. Unsurprisingly Chaos lost. In the final battle I used a different Chaos force than I had been using to represent the Nightlords abandoning the system with the meager spoils they claimed just as Chaos re-enforcements meandered onto the scene. Given the once sided nature of the campaign it was inevitable that Chaos would turn on itself. Warhammer 40,000 – Cadians are always a popular choice, particularly for a basic 3C + Wash paint job. Castellan Green, Agrax Earthshade and some metallics make quick work of these bad boys. Warhammer 40,000 – The Black Legion commission I periodically do work on continues to supply a steady stream of models to fill out any options he doesn't own yet. At this point the models I've seen are less common for bulk painting so the models tend to be a bit more unique. 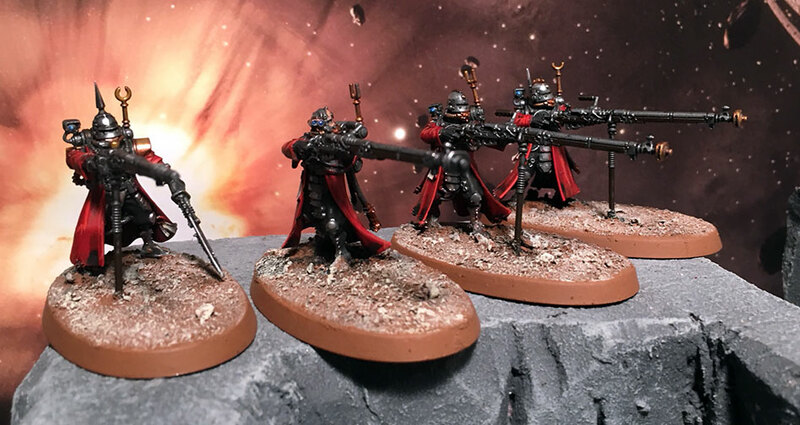 Warhammer 40,000 – Escalation Leagues are typically a sneaky way to get people to finish off a force or get a reasonable amount of models painted. Which is great because typically you win the war against gray plastic thorough escalation. Tying it into a campaign system is just a bonus. 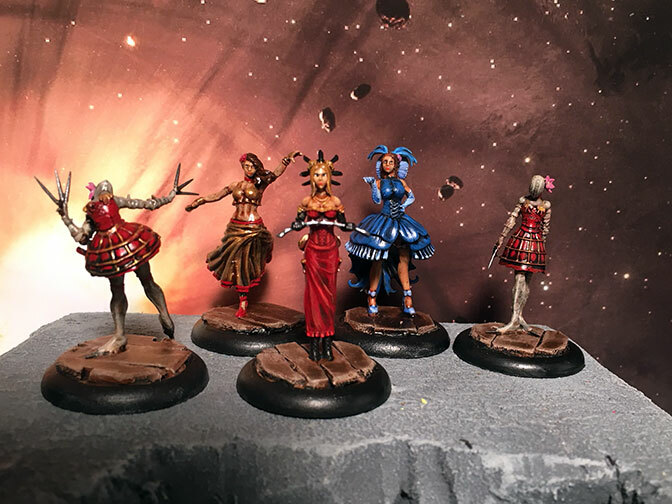 Malifaux – This group is sealed and ready for a trip down-under. Board Games – Shadows of Brimstone (the chronically mispronounced game "Shadows over Brimstone") has a ton of expansions. 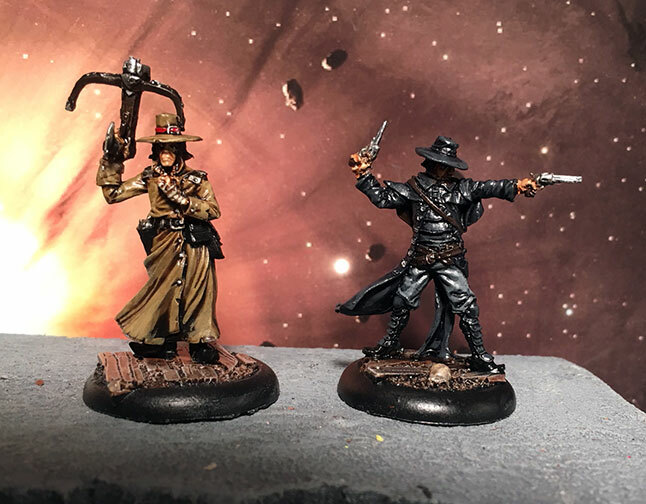 Most recently I painted up the "Allies of the Old West" expansion. This added a few miners/outlaws, a black smith, pack mule and dog to my client's collection for the game. Necromunda – I've always loved Necromunda, the idea of fighting in a the slums of a giant city with a small gang is just so cool. The original game (and it's nearly identical reprint) was incredibly fun even though their were some noticeable issues with the campaign system and the common problem of some gangs growing to fast for anyone else to catch up. The newest version of the game seems to have addressed those issues and introduced some new ways to play. Malifaux – I have a regular client that sends me stuff after Gen Con each year and doesn't need it back until the following year. This is really cool as it gives me plenty of time to work it in, but somewhat bad because I tend to push it back for hotter deadlines. Warhammer 40,000 – One of the coolest (or most annoying) things about 8th Edition 40k is list construction. The Keyword system means you can cherry pick the units you want to build whatever force you want. From a thematic aspect this is very cool as it can represent the disparate forces abandoned to the darkness after the Great Rift ripped the galaxy in two. Which means it's feasible to have several units of marines traveling with the remnants of a guard regiment being led by some group of Imperial Heroes with a Knight backing them up. Or recreating odd pairing that you see in Black Library books all the time. For instance I'm reading Death of Antagonis right now and am tempted to pick up a Canoness to run along side my Imperial forces. It's not super strong but could make for a cool narrative. Warhammer 40,000 – I don't think I can extoll the virtues of making up your own force and color scheme in 40k enough. The flexibility it affords and money you can save in the long run is really worth it. Of course you'll occasionally get somebody who gives you the side-eye every time you say successor chapter but whatever that will happen regardless of what you do. Escalation League – I got more points than you and didn't win? Warhammer 40,000 – If you build a list to table an opponent in 2-3 turns you will win 90% of your games this is the sad truth with most tabletop games. Weird missions and other things to improve tactics so players play to the mission are great. But when the final score doesn't matter because you have no models left does playing to the mission matter? Warhammer 40,000 – After last week I'm not sold on the Juggernaut Lords, they did ok, but I'm not sure they are my style. If the Knight wasn't there I think they would have been shot down early in the game. This week I'm going back to the Raptors and Tzeentch Daemons. The reality is this is the style of force I wanted to play when I started putting together Night Lords and I should have just stuck with it. Sure there's tons of stuff I could do with the Chaos keyword but thematically scary stuff dropping out of the sky to stab you is what I wanted. Not a whole lot of command points with this build. I'm not sure I'll be deep-striking many Daemons this time. Honestly I shouldn't have to everything moves at least 12" but the cultists so closing the gap in mass should be easier. One of the things I've noticed with trying to alpha-strike constantly is a.) my opponents expect it and b.) if things don't go perfect those few units you dumped in are unlikely to survive. Warhammer 40,000 – It's always weird to me when a Chapter Tactic that has been traditionally overlooked suddenly becomes really good. With the Raptors successor chapter using their special character rules combined with their parent chapters tactics you have a very potent gunline or alpha strike with the best of them. Dreadball – Mantic Games. the kings of making a budget minded version of someone else's IP. Well at least that's what they used to be known for. Need a cheaper fantasy army that looks different check out Mantic. They've grown leaps and bounds since they started out but I still always get that store brand feeling with most of their games. I haven't had a chance to try out Walking Dead yet, but from what I've seen it might be the game that breaks Mantics mold for me. Dreadball was a futuristic sports ball game that seemed to be a rift on Blood Bowl. The difference being I actually enjoyed the demo I played of Dreadball. Not enough to invest but it was fun. That is until they announced the Kickstarter for Dreadball Extreme. Prison Rules seemed up my alley and I was excited. After the Kickstarter wrapped and the core box was delivered there were delays and changes to the rest of the releases for game. Extreme ceased being it's own game and became more of a optional way to play the core game. I got as far as reading the rulebook on this one. The negativity from the Kickstarter boards killed any excited I had for the game and it sits shelved. I had hopes of bringing it out eventually, but with a fresh version of Bloodbowl as well as Guild Ball; I think that niche market is flooded. Is Dreadball still kicking in your area? Was it EXTREME enough to survive? Let me know in the comments below. When the Inquisition is involved does anyone win? Warhammer 40,000 – This week my Night Lords faced off against Space Marines and Sisters of Battle/Inquisition. Since the Inquisition was involved it's pretty easy to twist the narrative to accommodate a three-way carnage game. Warhammer 40,000 – I'm really happy with how my escalation league/campaign is going. For most of the last session I was play-testing a list I wanted to take to an event. Something came up however that means I won't be able to attend the event. That being the case I decided for this portion of the campaign to go another direction. Warhammer 40,000 – Necromunda used to be one of my favorite games. Sadly the awesomeness the is 8th Edition Warhammer 40,000 has overshadowed the game in my local group. Combined with the "lack of rules" for older gangs it's been a hard sell. However once we wrap up our current escalation league I plan on doing a short Necromunda campaign. 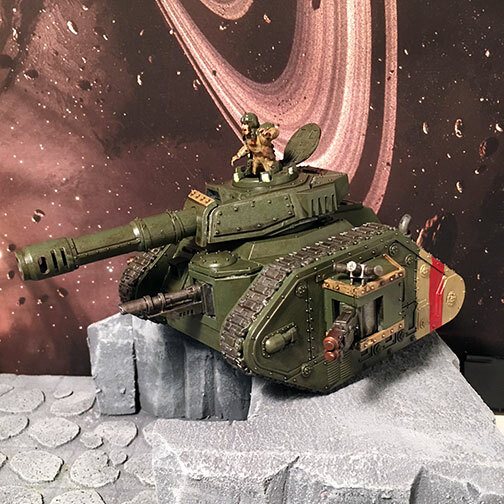 Warhammer 40,000 – For the fifth week of the Agrax Campaign I decided to modify my list a bit. Same models just trying different traits to see what works best. This time around I'm putting Daemon Spark on my Princess to bump up the damage potential from my Flamers. This force might still be to small to take best advantage of the alpha strike. What I've been seeing it while I can hit hard on the first turn I've generally loosing them to return fire, when I am able to put more threats on the table it should help this detachment survive a bit longer. 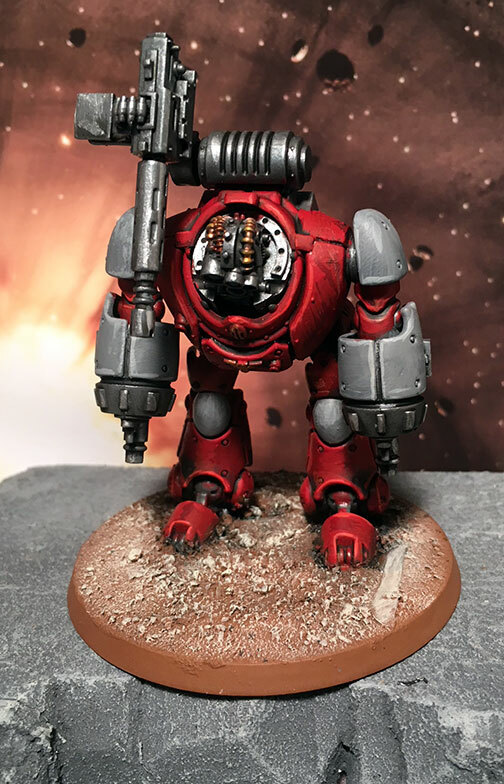 Last week I tried out bulking this out with a battalion, this week I'm trying the same thing but keeping the cultists back as objective grabbers. 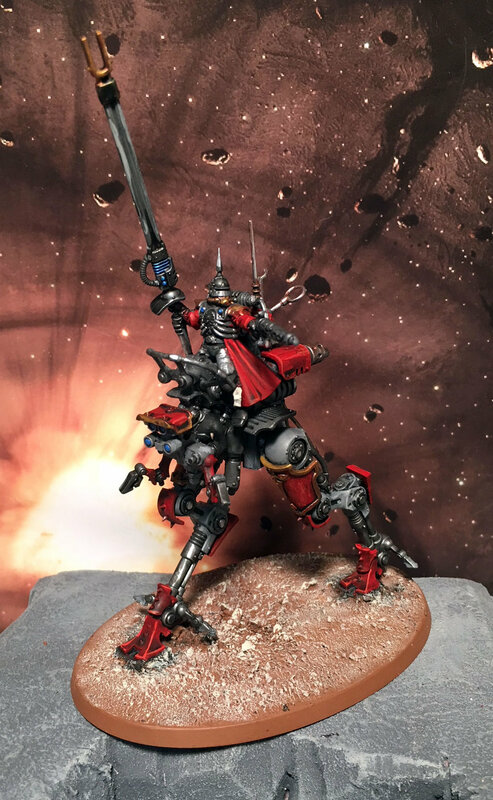 Warhammer 40,000 – I love reliability, every time I give one of my clients back a project he brings me another. I think his plan is to have every option covered with the forces he likes to play with so while it might be a different force each time there's almost always something. This time around I'm painting more Ad Mech. Different options of course but more red and gunmetal. One of my favorite models in this batch is the robot he converted to look like it's powered down. It's a fun nostalgic easter egg for those that get the reference and and cool way to make the robots look unique. Since the kit really only makes the static pose that's typically what you see on the table, and since its arguably the best unit in the book you tend to see lots of static posed "Robbie the Robots." The rest of the models are just head and weapon swaps from the rangers I've already painted. The long rifles look cooler in my opinion that the other option but it's hard to argue with more shots. Warhammer 40,000 – Many of my clients seem to be filling in holes in their collections as of late. Most recently I painted up these two Wyverns and a Nephilim Jetfighter. As with the previous models for this client these are just a basic paint job to match his existing models.